TECHNOLOGY - DEVONIAN HEALTH GROUP INC.
Devonian’s technology is based on a broad-based platform originating from over ten years of research. 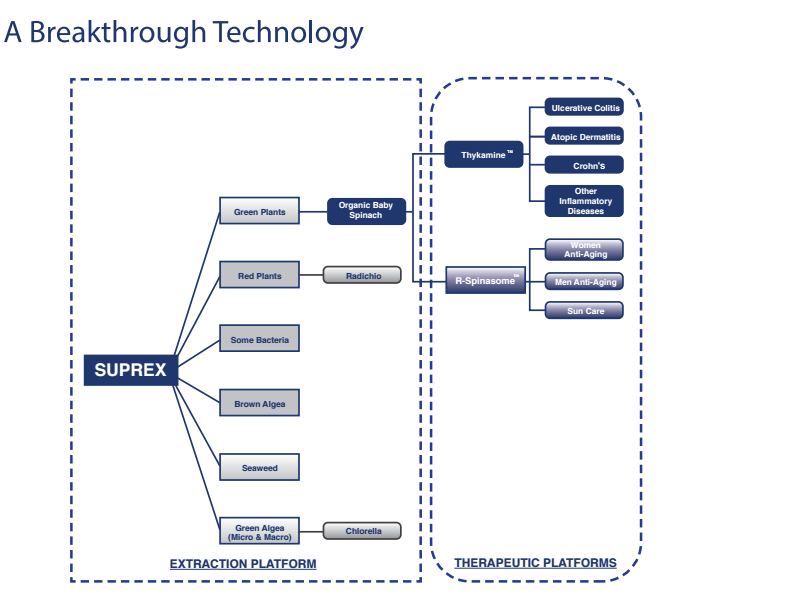 This platform provides a unique process of extraction, purification, stabilization and conditioning of molecular complexes, as Active Botanical Ingredients (ABIs), from plants and algae: The Supra Molecular Complex Extraction and Stabilization Technology (“SUPREX”). Each ABI has the potential to target several diseases making it a strong therapeutic platform. Thykamine™ is the first ABI issued from this platform. The potent anti-inflammatory, anti-oxidative and immunomodulatory activities of Thykamine™ have been demonstrated in several pre-clinical studies (in vitro and in vivo pharmacology studies; safety pharmacology; and toxicology studies) as well as in a Phase 1 clinical study in healthy adult volunteers, and in a Phase 2a “proof of concept” clinical study in patients with active mild-to-moderate distal ulcerative colitis. To date, all data support the potential use of Thykamine™ as a therapeutic platform targeting several inflammatory diseases. Devonian’s SUPREX platform uses a highly innovative process of extraction, purification, stabilization and conditioning of products from the active photosynthesis machinery of plants. Devonian’s water-based technology is protected by a broad IP estate. While the development of prescription botanical drugs is its core business, Devonian is also involved in the development of high value derma-cosmeceutical products as part of a secondary strategy to generate short-term revenues and optimize manufacturing efficiency. Devonian owns a state-of-the-art extraction facility with full traceability ‘‘from the seed to the pill’’.